Through this evening of song and theatre our audience will be taken on a compelling journey into the lives of a collection of characters. Featuring the vocal students of the Conservatorium of Music performing well-known and memorable show tunes, this showcase will be sure to fulfill all of your music theatre needs. 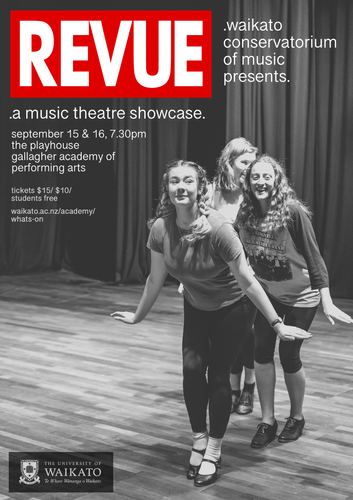 “Revue” will be set in an old styled cabaret theatre, with light food and beverages available from the bar to enjoy throughout the show. Tickets: Adults $15, Seniors 65+ & Uni Staff $10, Students w ID and children U 12 free (with ticket).